Each value is introduced to the whole school at the first assembly of each term. Follow up values lessons are taught to each class. Children are reminded of what the value looks like and sounds like and encouraged to nominate those they see demonstrating the value. The children’s achievements are recognised and celebrated in our celebration assembly. Being truthful even though you might get into trouble. Saying your opinion but in a kind and thoughtful way. Telling on someone only when necessary. Acting in a way that others can trust. Doing what's right, regardless of who’s around. Please Miss can you help, someone is going to hurt themselves or others. Sorry, I shouldn’t have done / said that. Accepting the consequences of my actions. Doing my share of the work. Taking care of myself and others. Contributing my ideas in group work. Facing your fears, something unknown or something different with confidence - being brave. Persevering with something you find difficult and asking for help if you need it - not giving up. Doing the right thing, even if it is difficult - setting a good example. What is courage? Which of these shows courage? 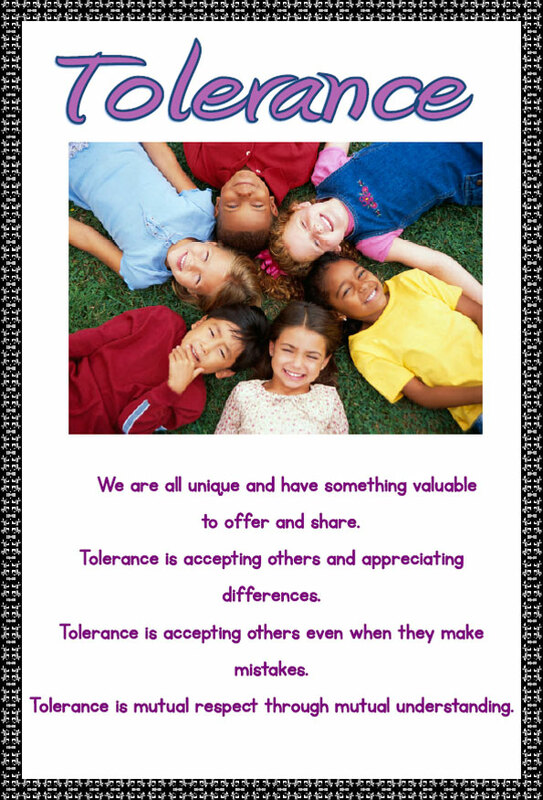 Tolerance is accepting others even when they make mistakes. Sharing, caring and being kind to others. Thinking of the other person before yourself. Looking out for or supporting others. Waiting for your turn in a game. Waiting to be heard when you have something to say. Not interrupting to make yourself heard.